The Lord's call to proclaim the Gospel to the world requires freedom and today that freedom is often threatened, Pope Benedict XVI told the College of Cardinals assembled at the Vatican's Paul VI hall Friday morning. The College of Cardinals along with the 24 Archbishops who will be elevated to the rank of Cardinal on Saturday, gathered for a day of reflection and prayer before tomorrow's consistory. The day of reflection began at 9:30 am with Cardinal Angelo Sodano, Dean of the College of Cardinals, thanking the Holy Father for the meeting. Pope Benedict then spoke, addressing the issue of freedom of secularism. He said freedom is needed in order to preach the Gospel, and today that freedom is often threatened. The relationship between freedom and truth is essential but that link is challenged today by relativism. He said relativism seems to be the completion of freedom, but actually threatens freedom. Cardinal Bertone, the Vatican's Secretary of State, also addressed the Cardinals and Cardinals-elect, outlining the current risks to freedom of Christians in today's world. He outlined the work of the Holy See in various areas of the world to safeguard the freedom of Christians. He specifically mentioned the risks to freedom of religion in Islamic countries. He reminded that the Holy See has worked with the United Nations to help guarantee freedom of religion of all believers. Cardinal Antonio Cañizares Llovera, head of the Pontifical Congregation for Divine Worship spoke to the cardinals about the importance of the liturgy in the life of the Church. 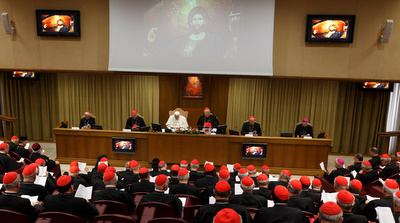 According to a communique released by the Holy See Press Office an "ample debate" followed the two speeches with 18 cardinals participating in the debate. The same communique said the theme of Inter-religious dialogue was discussed and suggestions were made by the Cardinals on how to respond to the challenges facing freedom of religion. The 126 Cardinals and 24 Cardinals-elect had lunch with the Holy Father after the morning session. A second session was scheduled for Friday afternoon.